Legacy is built daily. The Bezos Family. This weekend I watched this cool fireside chat between Jeff Bezos and his brother. Watch it in one sitting rather than in pieces. 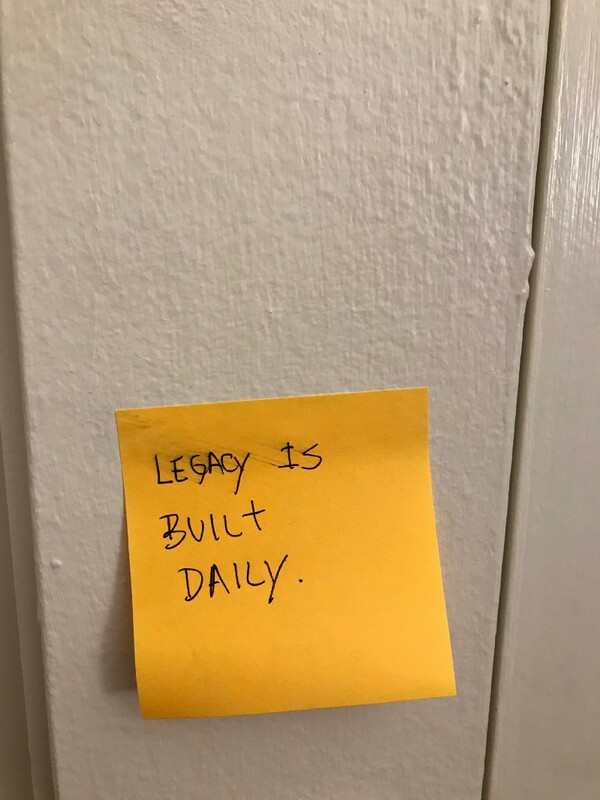 Daily, before I leave my bedroom for the day I stare at this post-it note that says "legacy is built daily". It is a powerful reminder. It goes well with "Bezos Day 1 policy", or the discipline that I see Sequoia Capital insert in their companies, with their anti-shortcuts approach, mixed with daily paranoia, Grove style. It reminded be of the importance of family and world exploration. It made me think that I need to venture out a bit more and not stare at my phone so much. I doubt that Bezos would have quit his Wall Street job if he didn't have such stellar grandparents that thought him grit from a young age. Nobody becomes this wealthy and powerful by accident. Also, I love his approach to dating. "I want a woman that can break me out of a third world prison".